I was unable to get on the Internet yesterday, so a few days worth of updates. Spent Wednesday morning working in the clinic. Sorted pills, did filling and watched a class being taught on how to correctly take your medication. Students were very attentive and the teacher was great. It was in Swahili, so I did not understand much but could tell by the way the class was responding that it was well done. Bought an instant camera to bring with me and it has proven to be a good investment. Everyone wants pictures of themselves and they proudly pose for the camera. Explaining that it takes a while for the photo to show has been a challenge but we are somehow able to understand each other. Wish I had brought twice as much film, but will leave the camera at the center and try to send film for them to continue the picture taking. Many of the clients also volunteer in the center. Very inspiring to see them work so hard helping in any way they can. They are grateful for the free medication and the kindness of the staff. Several of the men helped to repaint the center since I have been there. I tried to help, put painting is not my strong suit and it was pretty clear I was the weak link in the bunch. Spent the afternoon at another AIDS Clinic in a smaller village. We had “kids club” where they did art therapy and talked about being responsible for taking their medication and taking care of themselves. Many of the participants will start Secondary School later in the year which is very rare. Apparently it costs money and most families cannot afford it. Exploring how I can help sponsor some of the children to go to school. Not much money to us; likely the cost of our weekly coffee. Gave them their own soccer balls (thank you Nike) to keep at the center and they were very happy. Thursday was a day spent in the field going on client home visits. The poverty was worse than I could have ever imagined. We had to walk much to most of the homes because they were in remote areas. The clinic goes out to the homes to make sure the clients are taking their medicine properly and that they are doing well. Incredible work from the staff and the community volunteers. Truly amazing. So many heart breaking stories from today. Many families where all the members are HIV positive. The children generally do well on the drugs, but the poverty is debilitating. Again, just going to school is a big effort financially. We brought food stables for them and some small gifts like crayons and pencils. Met Martin and his family. 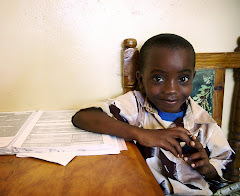 Martin is doing well but cannot afford to go to school much longer. I am working on paying (it is $100 per year) for his school. He wants to be a lawyer and is very bright and a wonderful boy. After we left, he walked two hours there and back to the clinic to get his medication. During the walk to the last home we visited, I created quite a stir. Many of the children rarely, if ever, see a white person. Children started running around the village telling each other that a white person was there and pretty soon I had about 20 children following me saying “how are you”. It was really great and I took their pictures and they wanted to touch my hand. Heart warming and impressed that even in dire poverty, these children seemed happy. Tomorrow is my last day and will do some more field visits in the morning and Senior Teen's Club in the afternoon before I leave. I will leave with mixed emotions. Very ready to come home and have a hot shower, sleep in my own bed and feel safe, but what I have seen and experienced will remain with me on many levels. Knowing all I have makes me feel a little guilty that by the luck of the draw I was born in the United States where for most people, things are much easier. I know I cannot let myself dwell on this because feeling guilty does not do any good. I will channel that energy in figuring out how I can continue to help and would like to focus on making sure some of the children I met can get their school fees paid. I am very glad I was able to have this experience and hope my pictures and stories will raise awareness for my friends and family.